Billy and Suzie (nearing completion), oil on hardwood panel, 24" x 36"
I've begun a series of paintings with the working title "At the Feet of the Master(ed)". 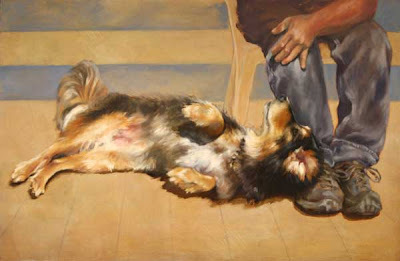 In it, I hope to depict the close and complex relationships between people and their pets. Given the multi-billion dollar pet industry and new niche businesses like doggie daycare, professional dog walking services, and gourmet and organic pet food companies, the question of who is master of whom is more apropos than ever. I'm not sure whether I'll depict my human subjects in part, as in this painting, or whole, but as I learned in my much earlier Drinks in Hand series, in which I painted only the hands of my sitters holding favourite drinks, some models are more willing if they know they won't be readily identifiable in the finished paintings. Below, is a series of photos of the painting in progress. Glad to see your back. I kept checking back hoping you would return. I am excited to see your series on animals and their masters. I can surely relate as I too love my dog. This painting says it all. Great Work! Thanks for the vote of confidence Kim.